Let’s get real. There’s no such thing as a perfect shower pan, just as there’s no perfect person. Shower pans are not a one-size-fits-all proposition. There can be, however, a perfect shower pan for your specific situation. Here’s the problem you’ve likely run into trying to find the perfect shower pan for your job. When you visit shower base manufacturers web sites what do you think they’re pushing? This is not a trick question. They’re pushing their pans. They’re claiming their units are the ‘ultimate fighting warriors’ against all shower evils. They have the best pan known to man, woman and child (as if kids are even interested). You’re left to sift through the B.S. You’re left to read on-line reviews (to the extent you have the time and desire to do this). You’re left to come to your own conclusions (even though you’re not a bathroom remodeling – or shower pan expert – and don’t play one on TV. Come to think of it, no one plays one on TV either). As a guy who leads a business which daily is knee-deep in wholesaling and installing different types of shower bases, I’ve had the ‘pleasure’ (sarcasm intended) to see the good, the bad and the ugly in shower pans in our journey to make bathrooms great again (OK – if I’m being hones, most bathrooms weren’t great in the first place). The goal of this article is simple. It’s to help you find the perfect shower pan for your situation. To do this we’ll look at different goals you may have. Here’s some popular shower pan goals. See if yours is on the list. Goal #1 – You’re looking for a cheap base. You own a home in a not-so-great section of town you’re looking to flip. You need a pan which fits a tight budget. Goal #2 – You’re looking for a base which is simple to clean. You’re tired of living your life scrubbing grout joints or staring at a dirty fiberglass shower pan you can’t get clean no matter what you do. Goal #3 – You want a contemporary design. Most shower pans you’ll find are big, bulky and ugly. You’re trying desperately to find a design which looks modern. Goal #4 – You need a roll in or one level shower pan. Sometimes a shower pan isn’t a want, it’s a need. A member of your family isn’t getting around like they used to. You need to find a pan which works but doesn’t like it belongs in a hospital room. Goal #5 – You want a shower pan which is built like a tank. Since the last pan cracked and leaked onto your mahogany dining room table you vowed this will never happen again. This time you’ll look for a shower base built like a tank. Goal #6 – You need a custom size. You don’t want to pay an arm and leg for it. So many shower floor pans – from walk in designs to odd sized tile showers to drains in weird locations – require custom sizes. You don’t buying one to cause you take out a 2nd mortgage, but you want a nice-looking shower which lasts and won’t be a pain to maintain. 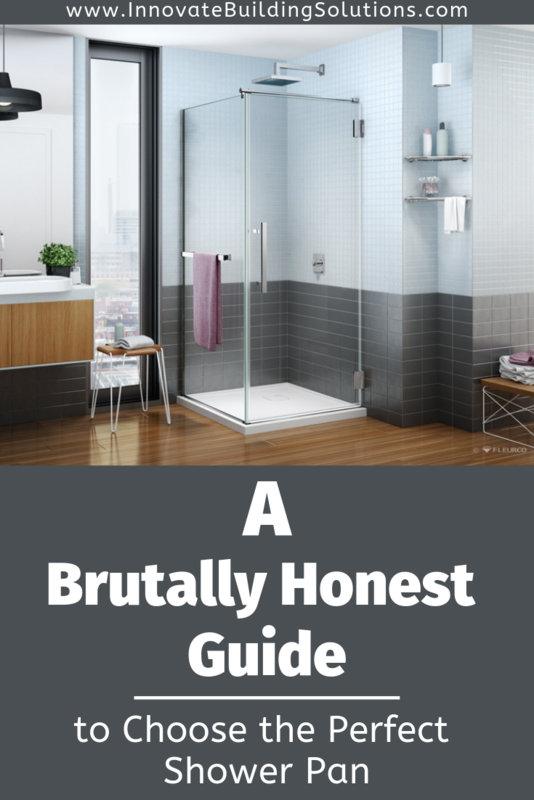 So, now that you’ve checked out the 6 goals, let’s dig into the brutally honest guide to the perfect shower pan which will help you achieve you find the best one for your situation.